Stars in the globular Cluster NGC 6397. Despite what we may imagine, stars are not fixed and unchanging. Stars are formed, evolve and eventually exhaust their energy sources to end up as some type of stellar remnant. Although stars are not "alive", astronomers often talk in terms of a life cycle of a star and stellar evolution. Astronomers have developed a solid model for the key stages of stellar evolution though many details are still being tested and refined. In this page we get an overview of the basic properties of the main types of stars, focusing on their sources of energy. This page is a condensed version of the stellar evolution section of the HSC Astrophysics option. Gravity is the force responsible for stellar formation. Protostars form when sections of giant molecular clouds start to collapse. Clouds are initially diffuse enough that they do not contract unless something triggers an increase in the density of some regions within a cloud. Triggers for this initial collapse may include nearby supernovas or compression due to the motion of the arms in a spiral galaxy though other mechanisms are also possible. The gravitational collapse of a giant molecular cloud does not result in a single, massive star. Instead the cloud tends to fragment into smaller denser regions that each collapse to form star systems. Up to a few thousand stars may typically form in a collapsing GMC resulting in an open (or galactic) cluster. A star forming region in M 17, also known as the Omega or Swan Nebula, about 5,500 light years away in Sagittarius. For more details read the press release. As it radiates away energy, gravitational collapse pulls the protostar inwards rapidly. Its temperature rises but this is offset by the decrease in size so that overall luminosity decreases significantly. Our Sun, a main sequence star. Our Sun is a main sequence star. Other examples include α Cen, similar to the Sun, the cooler, redder and fainter Proxima Cen and hot, bright Achernar. What makes all these stars main sequence stars? The answer is to be found deep inside such stars. The core temperature of main sequence stars is hot enough (> about 10 million K) that hydrogen nuclei (protons) can overcome coulombic repulsion and fuse together. The net result of this is that through several steps, hydrogen is fused to form helium nuclei. In the process a small amount of mass is converted into energy, released in the form of high-energy gamma photons. This hydrogen fusion (sometimes termed hydrogen burning although it is not a combustion process) provides the radiation pressure that supports main sequence stars against further gravitational collapse and ultimately is the source of energy fuelling life on Earth. The proton-proton chain is the main hydrogen fusion sequence powering main sequence stars such as our Sun and those of lower mass. The net result is that four protons are fused to form a He-4 nucleus, gamma photons, positrons and neutrinos. The total mass of the products is slightly less than the constituents - the difference being converted to and released as energy. A different sequence, the CNO cycle (for carbon-nitrogen-oxygen) dominates in higher mass main sequence stars. In the CNO cycle carbon-12 nuclei act as nuclear catalysts but the overall result is much the same as for the proton-proton chain, four protons are converted into a He-4 nucleus, releasing energy, primarily as high-energy gamma photons. The main factor that determines where a star lays on the main sequence is its mass. A star with a mass of about one-tenth that of the Sun has just enough gravitational force to heat the core to about 10 million K, the temperature needed for hydrogen fusion to start. If a protostar is less massive than this, fusion cannot be triggered and it becomes a brown dwarf or a "failed" star, emitting energy in the infrared. The greater the mass of a main sequence star, the higher its core temperature and the greater the rate of its hydrogen fusion. Higher-mass stars therefore produce more energy and are thus more luminous than lower mass ones. This comes at a cost though. High mass stars consume their core hydrogen fuel much faster than lower-mass ones. Our Sun has sufficient hydrogen in its core to last about 10 billion years (1010 years) on the main sequence. A five solar-mass star would consume its core hydrogen in about 70 million years whilst an extremely massive star may only last three or four million years. What happens when a main sequence star exhausts its stock of hydrogen within its core? Eventually the hydrogen fuel in the core runs out and fusion stops, shutting off the outward radiation pressure. Inward gravitational attraction causes the helium core to contract, converting gravitational potential energy into thermal energy. Although fusion is no longer taking place in the core, the rise in temperature heats up the shell of hydrogen surrounding the core until it is hot enough to start hydrogen fusion, producing more energy than when it was a main sequence star. This so-called shell-burning causes some interesting effects.The increased radiation pressure actually causes the outer layers of the star to expand to maintain the pressure gradient. As the gas expands it cools, just as a spray can feels colder after use as the gas has been released. This expansion and cooling causes the effective temperature to drop and the star thus appears redder. Convection transports the energy to the outer layers of the star from the shell-burning region. The star's luminosity eventually increases by a factor of 1000 × or so. During this stage of expansion, the star will move up and to the right on the HR diagram along the Red Giant Branch (RGB). A G (V)-class star such as our Sun may end up as a high-K or low-M giant. Stars such as this are commonly referred to as red giants. When the Sun becomes a red giant it may have a radius 100 times larger than that it has as a main sequence star. The density of the outer layers of the red giant are extremely low. A star with the mass of our such Sun moves off the main sequence and up the red giant branch, fusing hydrogen into helium in hydrogen shell burning. A very short helium flash sees the start of helium core fusion and the star moves along the horizontal branch. Once the shell temperature is sufficient, helium shell burning starts and the star moves up into the asymptotic giant branch (AGB) on the HR diagram. The red supergiant Betelgeuse, imaged by the HST. Supergiants such as Betelgeuse, Deneb, Rigel and Antares are some of the most prominent stars in our sky and visible over vast distances due to their extreme luminosities. These high-mass stars are rare and have very short lifespans relative to lower-mass stars. High-mass stars consume their core hydrogen at prodigious rates so may only survive on the main sequence for millions rather than billions of years. Once this fuel is used up, the core contracts due to gravity and heats up. This triggers helium-burning in the core. Unlike lower-mass stars, this helium fusion (triple-alpha process) starts gradually rather than in a helium flash. In moving off the main sequence, the effective temperature of the star drops as its outer layers expand. The decrease in temperature balances the increased radius so that the overall luminosity remains essentially constant. Energy liberated by helium fusion in the core raises the temperature of the surrounding hydrogen shell so that it too begins fusing. In time the core helium is used up resulting in further core collapse and gravitational heating. This then triggers carbon fusion to produce sodium, neon and magnesium. Depending on the mass of the star, as each core fuel is used up further collapse leads to even higher temperatures that can trigger fusion of heavier elements. Through a combination of fusion and photodisintegration a range of heavier nuclei are formed up to iron for the most massive stars. The core region of a supergiant eventually resembles the layers of an onion with a dense iron core surrounding by shells of silicon and sulfur, oxygen and carbon, helium and an outer shell of hydrogen as shown in the diagram below. The final core temperature reaches about 7 × 109 K.
The onion-like layers inside a supergiant in the final stages of its life. Successive layers correspond to the different elements produced by fusion, with a dense core of iron at the centre. Nucleosynthesis of elements above helium is less efficient so that each successive reaction produces less energy per unit mass of fuel. This means that the reactions occur at greater rates so that radiation pressure balances gravity. Whilst a massive star may spend a few million years on the main sequence, its helium core-burning phase may be a few hundred thousand years. The carbon burning phase lasts a few hundred years, neon-burning phase a year, oxygen-burning half a year and the silicon-burning that produces iron takes only a day. In the last stages of a supergiant when the core temperature reaches 1010 K, iron can photodisintegrate, releasing gamma photons, protons and He nuclei. As iron is energetically the most stable nucleus, such reactions absorb rather than release energy and so the outward pressure drops. The core thus contracts further at speeds reaching tens of thousands of kilometres per second. The degenerate core electrons eventually have sufficient energy to react with the protons released by photodisintegration. This removes the electron degeneracy pressure so that core collapse continues. Once the temperature reaches 1012 K the neutrons become degenerate. Neutron degeneracy pressure actually stops the inward collapse of the core. The surrounding material is still collapsing, however, and slams into the now solid, rigid core and rebounds, forming a massive shockwave. This is similar to what would happen if you run headlong into a wall - you bounce back. In the collapsing massive star the energy involved is vastly greater than you running in to a wall. A total of 1046 J is released in a matter of seconds, 50 × more than the Sun will release in 10 billion years on the main sequence. The massive star is ripped apart, becoming a Type II supernova. A Type II supernova reaches a luminosity of about 109 × solar luminosity at maximum brightness for a few days before fading over several weeks. It will outshine the combined luminosity of all the other stars in its spiral galaxy for a few weeks. Stars about 20 × the mass of our Sun may form a Type II supernova. In 1987 a massive star in the Large Magellanic Cloud, a satellite galaxy of our own Milky Way, became a supernova. This star, SN1987A, was the first supernova visible to the unaided eye in over 300 years. After and before images of SN1987A in the Large Magellanic Cloud. During the final destruction of the star in a supernova explosion, a high flux of neutrons is released as iron nuclei are ripped apart. These neutrons can be captured by many of the heavy nuclei to produce other nuclei in a method known as the r-process (r for rapid). The high number of neutrons available in these few seconds can be captured by unstable nuclei before the nuclei have had a chance to decay. In this way nuclei of elements such as lead, gold and all the way up to uranium can be synthesised. The gold in jewellery here on Earth was in fact formed during the fiery last seconds of a massive star. The destructive event not only creates new elements but provides the mechanism by which they are dispersed into space as a supernova remnant (SNR). The white dwarf, Sirius B (the small dot at lower left) and its main sequence companion, Sirius A. Stars with masses similar to our Sun will end up as white dwarfs. These stellar remnants have unusual properties. Firstly, they are very small but the more massive white dwarfs are actually smaller than less massive ones. With their fuel used up no fusion takes place so there is no outward radiation pressure to withstand gravitational collapse. More massive stellar cores experience stronger gravitational force so actually compress more. A 0.5 solar-mass white dwarf has a radius 1.9 × that of Earth, a 1.0 solar-mass one is only 1.5 earth radii whilst a 1.3 solar-mass white dwarf 1.4 earth radii. A white dwarf is composed of carbon and oxygen ions mixed in with a sea of degenerate electrons. It is the degeneracy pressure provided by the electrons that prevents further collapse. A white dwarf, with a mass roughly that of the Sun packed into a volume not much greater than the Earth must have an extremely high density. At 109 kg m-3 its density is one million times greater than that of water. Although its surface temperature is about 10,000 K, the core temperature may be as high as 107 K. The heat trapped within a white dwarf will gradually be radiated away by it but with its small radius, a white dwarf has only a small surface area. Heat therefore cannot escape quickly. In fact it will take tens to hundreds of billions of years for a white dwarf to radiate away its heat and cool down to a black, inert clump of carbon and degenerate electrons. As the Universe is not yet old enough for this to have happened, all the white dwarfs that have ever formed in single-star systems are still white dwarfs. Typical luminosities are less than 10-3 that of our Sun. More massive white dwarfs, having smaller surface areas but more trapped heat, take longer to cool down than lower-mass ones. As white dwarfs are so faint they are also hard to detect. We are only able to observe relatively close ones. Nonetheless white dwarfs are thought to comprise about 10% of the stars in our galaxy. Nearby examples are Sirius B and Procyon B, both of which are found in binary systems. 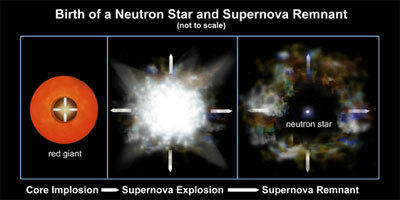 A massive star undergoing core collapse produces a Type II supernova. What happens to the core material that is not ejected depends on its mass. Photodisintegration of iron in the last stages of the massive star's life releases protons that in turn react with electrons to form neutrons. These neutrons combine with existing core material to form neutron degenerate matter. If the remaining mass of the star is less than about 3 solar masses the collapse of the core is halted by the degeneracy pressure of the neutrons. The result is one of the most intriguing types of objects in the Universe, a neutron star. Neutron stars are composed of degenerate neutron matter with a density about that of atomic nuclei, ~ 1017 kg. m-3. A thimble-full of this material has a mass of almost 109 tonnes. They range in mass from a lower value equal to the Chandrasekhar Limit of 1.4 solar masses up to about 3 solar masses. This upper limit is not well-defined and may be up to 5 solar masses in some models. A neutron star is typically about 10 km across. We thus have a very exotic object with twice the mass of the Sun packed into a sphere the size of a small city! Due to the conservation of angular momentum, a neutron star spins at a high rate. This is analogous to an ice skater spinning faster as they draw their arms in close to their body. Whereas a star such as the Sun rotates on its axis roughly once a month, a neutron star can rotate dozens of hundreds of times a second. Sometimes though a star is so massive that the mass of the material left after all other mass-loss processes exceeds the limit that even neutron degeneracy pressure can withstand. At this stage then the material keeps collapsing inwards until all the mass becomes concentrated at a single point, a singularity. It is now a black hole. Black holes are even more exotic objects than neutron stars. With all the mass concentrated at a point they have extremely high gravitational fields. They are referred to as black because not even light can escape from them once it has crossed a region known as the event horizon. At the event horizon, the escape velocity equals the speed of light, c. Black holes are therefore hard to observe because they do not emit light at any waveband. Rather than look for a black hole itself, astronomers infer their presence due to their effect on surrounding matter.